Halfway into the 1971 classic film Willy Wonka & the Chocolate Factory, Gene Wilder, wearing an orange top hat and oversized bow tie, excitedly shows off a special wall covered in fruit-decorated wallpaper. “Lick a pineapple,” he implores. “It tastes like a pineapple. Try some more! 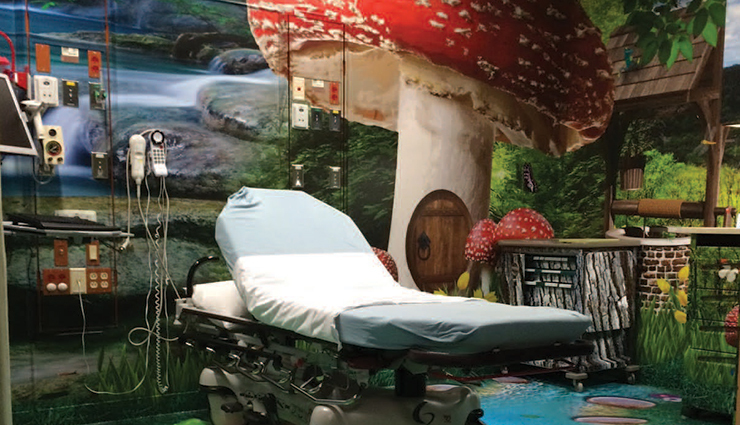 The snozzberries taste like snozzberries!” While snozzberries and lickable wallpaper are the stuff of fiction, the interactive wonderland of Wonka’s chocolate factory is not far from reality at Riley Hospital for Children at Indiana University Health in Indianapolis, Indiana. Like Wonka, Dietzen is the type of person for whom a brief introduction sounds at first like make-believe and probably does not do justice to the impact he makes on the field. His career spans collegiate football, professional wrestling, meetings with Mother Teresa, and photo shoots with Men’s Health magazine. He is involved with projects that deserve their own articles, like Champ Camp—a summer camp for medically fragile children who need respiratory support (think fully accessible hot air balloon rides, zip lines, horseback riding, fishing, the whole gamut)—and Timmy Global Health—a network that sends volunteer medical service teams to underserved areas around the world. He has spent the past 26 years in the field of pediatric rehabilitation, 7 of which as a pediatric hospice doctor. Most people call him Dr. Chuck. But Dr. Chuck is quick to say that he is not the story. The more important thing to highlight about him is his work to creatively engage people in the community to enhance the experience for the children he serves. He has a habit of bridging the gap between pie-in-the-sky ideas and practical ways to make them reality. If that means building relationships and working with people outside of the healthcare field, that’s just fine with him. It is this philosophy that motivated Dietzen when he connected with Jim Nash, president of Dreamakür (pronounced “Dream Maker”). Before Dietzen came along, Nash had been on his own Wonka-esque dream-making journey. For two decades, he had been a partner at Endagraph, a company that specializes in large-format custom graphics. 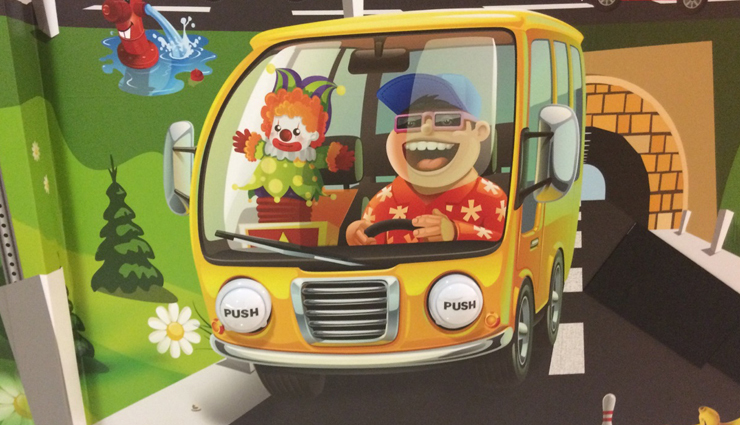 Since its founding in 1990, Endagraph focused mostly on outdoor visual advertising media, like the sides of airplanes and contractor vehicles and large wall spaces on stadiums and museums. But in 2011, Nash was contacted by Children’s Hospital of Pittsburgh for an unfamiliar project to help visually “distract” children during painful medical procedures. Nash had never worked in a healthcare setting, but during the project, he experienced what he describes as a series of divine taps on the shoulder. The discussion with the hospital quickly grew from simple decals to outlines for a custom design that covered all four walls and the floor of an exam room. “Within three weeks, my team had created a vision and storyline of a gnome who lives in the forest, residing inside an eight-foot-tall mushroom, riding along the top of a ladybug, and who plays with all the forest critters and animals,” says Nash, beaming. 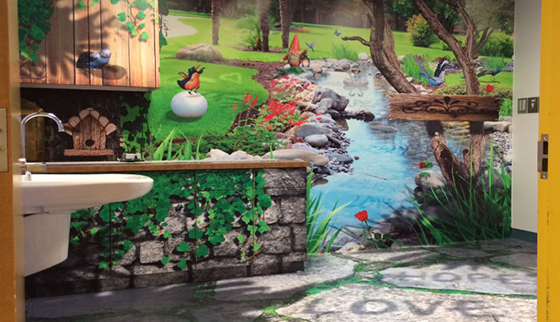 The Dreamakür Enchanted Forest distraction therapy room at Children’s Hospital of Pittsburgh. Click here to view more angles. Inspired by that experience, Nash founded Dreamakür as a new division of Endagraph that specializes in distraction therapy. Nash didn’t know it yet, but Dreamakür was set up to be a perfect partner for a person like Dietzen with a similar dream-making mission. When the two met in 2015 through a mutual friend, their creative juices immediately began to flow on how to transform the walls at Riley Hospital. The idea for distraction therapy has existed in pediatric settings in various forms for some time. Riley Hospital, in fact, had been using wall murals for years, hiring artists to design and paint the images by hand. But this process, along with many other distraction therapy ideas, is expensive and time consuming. Dietzen saw the Dreamakür products both as a way to make distraction therapy affordable and as a springboard to take the idea to the next level. Using the Dreamakür designs as a visual base, Dietzen teamed up with the EPICS engineering program at Purdue University to apply features to the walls that engage other senses as well. If the wall scene depicts a railroad crossing, for example, a switch can be added that triggers the sound of a train rumbling down the track. If there is something that would smell good, like the peppermint lollipop, oils can be added to the wall to make that a reality. They even did testing to discover the best method to create detachable leaves for the trees (magnetic backing). The goal is to engage as many of the special senses as possible and make the experience fun and interactive. A sensory integration wall with interactive headlights at Riley Hospital for Children at IU Health. But the solutions don’t need to be expensively engineered. Working car headlights are made from simple push-activated closet lights, and when Dietzen wanted to include stuffed parrots in the space designed like a rainforest, he bought a few from a Cracker Barrel gift shop. The plush parrots have a battery-activated voice feature that repeats phrases a child says. This has the nice added benefit of promoting expressive communication, and it comes from a simple toy. This type of sensory integration in the walls is as important for Dietzen as the images themselves. A scene depicting someone with a disability in a fun scenario, such as using adaptive technology to snow ski, is great to show what a kid has the ability to do. But being able to interact with the scene adds additional stimuli—for children to use their voices, stand up, or reach over their heads—that encourages the use of fine and gross motor control. The whole experience greatly supplements the core services being provided. And of course, the images and stimuli can be customized to reflect the needs of the population served. The final result is truly the creation of a wonderland. It’s easy to get lost in the experience of the rooms—even if just viewed on a computer screen—as if you were inside a picture book. And that’s the whole point. Nash says the images are inspired by the imaginations of children and are meant to release endorphins to keep the brain calm and relaxed. After seeing the images with the full sensory integration elements, Willy Wonka’s lickable wallpaper begins to feel a bit dull. ‘Only two major senses?’ you might ask. At Riley Hospital, you’d be able to touch and smell those snozzberries as well. Editor's Note: This article first appeared in the June issue of CARF's Medical Rehab Connection newsletter (2017, Issue 2). View the June issue, or subscribe to recieve future issues, at: www.carf.org/resources/newsletters/rehabconnection.